Herobrine is frequently referred to by Mojang, 4J Studios, the Minecraft Wiki and the Minecraft Forums. However, Herobrine has never appeared in Minecraft itself. We are currently looking for a factual video of this subject matter, similar to our Curse series of guides. If you are interested, please discuss this through the talk page. For formatting reasons, this page describes the subject in a canonical way. Being a community icon for Minecraft. Herobrine ( /ˈhæ roˌbraɪn/ (IPA key) ʜᴀʀʀ-oh-ʙʀᴇʏᴇɴ (respell key)) is the subject of a community-made creepypasta. He is one of the major community icons of Minecraft. Herobrine has not been present in any version of Minecraft. "Canon" of Herobrine is widely regarded as the first image/story ever posted about Herobrine, as well as the Brocraft stream. Anything posted after these two events are considered as fanmade adaptions/variations. 1 Is Herobrine in Minecraft? Herobrine is not in Minecraft. There are no references to him at all in the source code, and there is no code to allow for any entity to act like Herobrine. There is no level terrain code to generate 2×2 tunnels or elaborate dungeons with traps. There is no possible way Herobrine can ever exist in any unmodded clients or servers. Any claims that he is in Minecraft are completely false. Any appearances he may have are caused by mods being installed. All signs of Herobrine, like trees with no leaves, random glowstone towers, suspicious messages on signs, etc. are either glitches, formatted naturally, or placed by another player to mislead you. The Minecraft Wiki and Forums do not partake in any viral Herobrine hoax. Any deletion of Herobrine-related comments or stories are purely because Herobrine does not exist, and the stories are either fictional, with an intent to mislead others, or the result of users playing mods installed on their game (possibly without their knowledge). From the original creepy-pasta, Herobrine creates random constructions, such as sand pyramids in oceans and long 2×2 tunnels. He also cuts off all the leaves from trees. Herobrine first appeared in a single image detailing an encounter. It was posted on the 4chan's /v/ board, and gained very little attention. It stated how Herobrine had appeared in someone's single-player game, littering the map with various pyramids and tunnels. It is the first media to name him as Herobrine. It was only later that Herobrine grew in popularity, when the Brocraft streamer "Copeland" photoshopped Herobrine into several screenshots to show to his chat. He had recently taken a liking to the story, and wished to be a part of it. After getting largely good reactions, he decided to stage a hoax. He has explained exactly how that took place in an email. Copeland had played through the world as a normal lets-player would, deliberately avoiding the work-in-progress room he had set up for the hoax. Herobrine was introduced to the stream here (at 20:45). He is confirmed to be a retextured painting. Copeland then screamed and ran out of the room, promptly ending the stream. Copeland pretended to be shaken up in the chat, and later posted a message onto the forums, linking to the video to spread it around, in the hope to get similar reactions. After a while, Copeland removed the painting and reverted to normal textures. He proceeded to stream further, pretending to be scared. He announced that he would delete the world to never meet Herobrine again. Later on, Patimuss made a video showing Herobrine in a user-made lava field. This Herobrine was free-standing, unlike the previous video. Due to this, it is likely he was a retextured door. The livestream went down after Patimuss ran away and saved his game, only to resume ten minutes later, where Herobrine had disappeared. Later on, during the second stream, Patimuss can be heard talking to his wife, stating he was trolling. This flooded the livestream chat with outrage. He then faked a game crash. Copeland disliked that Patimuss outed Herobrine as a fake. It is unknown when exactly it happened in relation to Patimuss's video, but Copeland then posted links in chat, leading to http://ghostinthestream.net/him.html. This is likely where the nickname "Him" originated from. The page features Steve's face, but with real, frantically rolling eyes in the place of his block eyes, modified to be completely black. The message keeps telling the viewer to "wake up", implying they're living in a fantasy world, and this text hidden in the page is their "note". The above text is from another creepypasta, entitled "Wake Up". The stream proceeded later with no further Herobrine sightings. Copeland continued to adamantly state Herobrine was real for about a year onwards. The wiki asked Copeland several questions regarding the event, which are located here. Since the stream, there has been a huge increase in his popularity, propelling Herobrine to meme status, and making him an icon of the community. There are several mods, animations, pieces of artwork and constructions of Herobrine that have been created. In early June 2014 rumors of a new Minecraft "ghost" appeared, the earliest evidence of this being this video. The entity's name was allegedly "Entity 303" who was allegedly a former Mojang employee who killed Herobrine and intends to replace him. Notch replied with this twitter post. Herobrine has two distinct pronunciations. This is suspected to be because of pronunciation differences between America and Europe. It is speculated that most Europeans would pronounce the word as "hero brine", brine being salt-saturated water. While it is speculated that most Americans would pronounce the name as "Hiro brin". Both e's are pronounced differently, with the first e being pronounced as an i, and the last e being silent. The "European" version is seen as canon, mainly because the Brocraft team pronounced him as such in their livestream, and because Herobrine himself, canonically, is Swedish. Further study into what specifically has caused these pronunciation differences is in progress. To help, please see the talk page. Herobrine is Notch's dead brother, somehow embedded into Minecraft. While this is the "canon", this is also completely false in reality, as Notch has no brother. Ghost aside, there are two plausible canon theories remaining. Herobrine shows a lot of characteristics of being a form of virus, such as manipulating game worlds, deleting threads and sending messages through the Minecraft Forums. Perhaps also hacking into Notch's email and Twitter to reply on his own existence. Or, Herobrine is simply a figment of the users imagination. All users the user talked to, including Notch's email reply, could simply be the creation of the player's mind. This would also explain Notch's rejection of the canon, as showing the story is all in the user's head. Herobrine is near-certainly inspired by Slenderman, who is also the inspiration behind Endermen. The most popular theories among users is that Herobrine is a ghost. Other theories can involve him being a higher being, a demon, a bad omen, or the suggestions in the canonical explanation. However, most of these are written as if Minecraft itself is reality, rather than from the player controlling the avatar within the game. Herobrine canonically has not appeared in real life, and remains confined to technology. Herobrine is a human entity, with exactly the same skin as "Steve". However Herobrine has bright white eyes that glow in the darkness, as if they are a light source (compare with the eyes of endermen, spiders and cave spiders; which, whilst appearing brighter than their surroundings, do not actually emit light). Herobrine can sometimes be seen holding tools, such as pickaxes. This stems from the widespread community belief that Herobrine was a miner. Usually, his hands are empty. Herobrine is often portrayed by the community as a dead miner, killed long before the player's arrival. His appearance, however, does not suggest either of these are the case. But with Minecraft's abandoned mineshafts and strongholds, as well as mining being a large part of the game, the game itself has shaped public perception of the character to suit this persona. Herobrine is said to have the ability to run in Minecraft. This is indicated by the original source. The Brocraft stream portrays him as almost always stood up straight, with arms to his sides, watching the player. He is not seen to physically move within the Brocraft stream, but he moves location during the stream. It is unknown if Herobrine can swim, use minecarts, boats or Nether portals. Like most ghosts, it is likely he simply has no use for most methods of transportation. Much like angered Endermen, Herobrine is widely believed to move via teleportation. Nearly all of the community actually reject the canon, describing him as running. Herobrine cannot fly, and no variation states this as "canonical". However, he appears to be able to glide. Which is to say, moving in directions without physically moving, while not moving upwards. This is usually evident in retreating back into fog. Herobrine is often portrayed with his head crooked or twitching. This is likely due to him being seen moreso as a virus/creepy entity in Minecraft, rather than a ghost. Herobrine is able to build and destroy in Minecraft. The original image states the player found long 2×2 tunnels, small pyramids in the middle of the ocean and trees with no leaves. The full extent of Herobrine's building capacity is unknown, but the given examples indicate Herobrine has awareness of shape, and can differentiate materials from each other. Herobrine seems to solely target human players. He did not seem to interact with any other mobs nearby in the Brocraft stream, some of which were spiders and zombies. His canonical relation to further mobs added since he appeared is a complete mystery. His interactions with other mobs is not mentioned in the original image. While there is a chicken present in the image, Herobrine does not seem interested in it at all, and is solely focused on the player. Herobrine has, on occasion, interacted with other mobs. He is sometimes able to take control of passive animals, and revive/spawn undead mobs. Herobrine seems able to drastically change his environments with no viable source of resources to do so. Most expansions to his abilities involves cobblestone placing, dungeon building, using redstone torches and setting traps. He exhibits all the symptoms of a Creative player in the game. Herobrine seems unable to enter the Nether, or the End. Herobrine's intentions vary, but they usually fall under two categories. One variation is based on pure community interpritation, while the other, based on the canon. In the Stalker variation, he stalks the player, disappearing if approached. This variation is derived from his origins. In the Vengeful variation, he tries to ensnare the player in traps, presumably to steal their items. He waits for people to enter his dungeons, then either seals them inside, or teleports behind them, presumably killing them. Some rarer variations of this particular version says he breaks the player's creations, and steals their items from chests. This variation is likely inspired by griefers and trolls. Notch posted on Twitter about the subject of Herobrine, early in his popularity boost. RavenBurga Is "he" a real entity ingame or is it just a successful_troll.swf? Notch It's not real. =) But it might be soon! This confirmed there was no Herobrine, but suggested Notch planned to add him at a later date. At MineCon 2010, Notch confirmed Herobrine will be in the game, probably in a "seecret friday update". 12:25 Kizzycocoa [...] is there any confirmation on his upcoming existence in MC? 8:56 AM Oct 20th Notch i have no plans of adding herobrine. This confirms that Herobrine will never see an official release in Minecraft, and that any claims of "finding" Herobrine in vanilla Minecraft in future updates are completely unfounded. Herobrine in the LEGO Microword booklet. 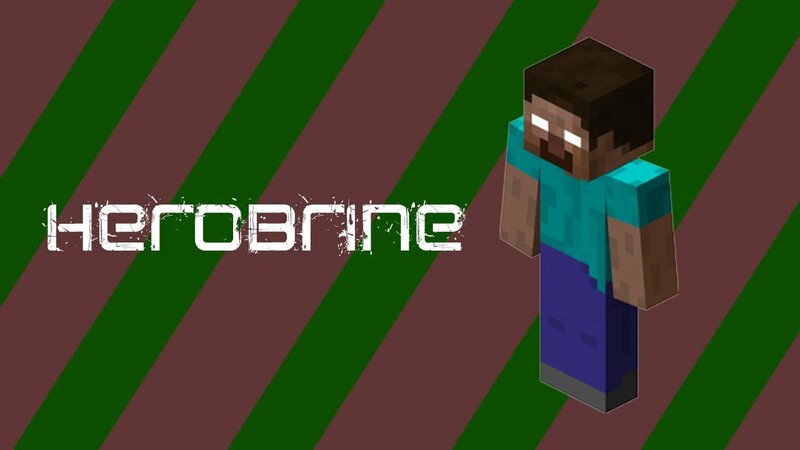 Herobrine has appeared in official Mojang images as an in-joke. His first appearance in official Mojang images started with the Wedding Weekend, in which he was just behind Notch's Minecraft character. His second appearance was in the Minecon header, where, yet again, Herobrine was just behind Notch. Herobrine also appeared in the the official Minecon trailer, created by Hatfilms, at 3:11. However, as users were asked to submit their skins to appear in the trailer, this is likely not intentional. Herobrine was also spotted at the Xbox section of Minecon. He was on the board, behind the Xbox stations. During Minecon's closing, a user named Zaralith won the Herobrine statue by answering the give-away question "How many Fable games are there?" correctly. Some users point to this as proof of his future addition. However, there is no proof he is being portrayed for anything other than baiting fans. Herobrine also appeared in Minecraft's Facebook page, the image being the Cover Photo. It is notable to state the image was created by the fan for a competition, with the theme of "summer picnic", hence his inclusion may not be fully intentional. Herobrine was first stated to have been removed in Beta 1.6.6. This was a joke, referring to Notch partially removing the human mob's essential code, making it unspawnable within Minecraft. An ulterior motive was to troll the community, as this was around the time Herobrine had gained mematic status within the community. Below is a table showing every version Herobrine has been "removed" in to-date. 1.2.1 Only noted on the Tumblr version of the changelog, viewed through the launcher. 1.2.5 Removal of all "ghost entities". Changelog entry read: "Removed all ghost entities under the command of Lord Herobrine". 1.4.2 Only noted on the Tumblr version of the changelog, viewed through the launcher. 1.6.1 Only noted on the Tumblr version of the changelog, viewed through the launcher. 1.7.2 Only noted on the Tumblr version of the changelog, viewed through the launcher. 1.11 Only noted on the Tumblr version of the changelog, viewed through the launcher. In the July Xbox update, Herobrine was removed from the Xbox version of Minecraft for the first time. It is very likely that 4J Studios, the developers behind the Xbox version, will continue this long-running inside joke. On the Xbox 360, Herobrine is mentioned on one of the splash messages. Herobrine is part of a skin pack, released on the Xbox 360. See Screenshot Here. Because of this skin addition, "sightings" have risen drastically. However, all Herobrines on the Xbox are simply players, using the Herobrine skin. Herobrine then made another appearance in the 3rd skin pack for the Xbox version, where a "Zombie Herobrine" skin is available. In the latest up date for the game Scrolls, 0.103.0, Herobrine being removed was in the change log miscellaneous section. Mojang has, albeit rarely, shared their views on Herobrine. “ oh god no entity 303 what is wrong with you people its just a game i cant deal with this. Go read a science, people! There are no ghosts! “ Fine, Herobrine is real, and he gains spooky vengeance haunting power whenever you remind me of him. Only way to stop him is to ignore him. “ The Herobrine stuff is awesome and kind of scary at the same time. It really shows how little control a content producer has over the content. Note: Minecraft Wiki is looking for more responses from Mojangsters that have not already been quoted. Please post links to these on the talk page. When asked about audio player implementation in the wiki, and limits of what could be uploaded, C418 replied to Herobrine claims relating to disc 11. He stated that he cannot say a lot about 11, but that it is not anything to do with Herobrine. There is a user called Herobrine registered on the Minecraft servers. The account is a full account (meaning they have bought Minecraft after registering). The owner of the account is unknown. They have not visited any Minecon using the Herobrine username, due to their lack of a cape texture. This user runs a Legacy Minecraft account rather than a modern Mojang account, meaning that they would log in using their username rather than an email address. The Herobrine livesteam was located here. Regrettably, it was deleted. We are unable to locate any existing copy or recording of the stream. Copeland and the Brocraft founder have both stated that they do not have a backup copy of this stream. We are reaching out to any users who may have recorded this stream for personal use, to share the footage for future generations of Minecraft fans. Η σελίδα αυτή τροποποιήθηκε τελευταία φορά στις 25 Ιανουαρίου 2017, στις 03:32.